Summer has truly struggled this year to reach this part of the country, but now it’s finally here, and not a moment too soon… Time to lace up our hiking boots and start again exploring the Adirondack’s wilderness. I feel that one of the most picturesque scenes one can find in these mountains is the familiar groves of white birch that dot the landscape. These groves are so characteristic of this area that they have become symbolic. I’m fascinated by how the white irregular bark of these slender trunks contrast with the dark background of the forest’s undergrowth. When the light finds its way through the dense foliage and reaches the trees, the brightness of the bark is breathtaking… I often welcome the challenge of transposing that magical quality into my paintings, focusing more often than not just on the characteristic bark with its textures and colors leaving the foliage to the imagination. 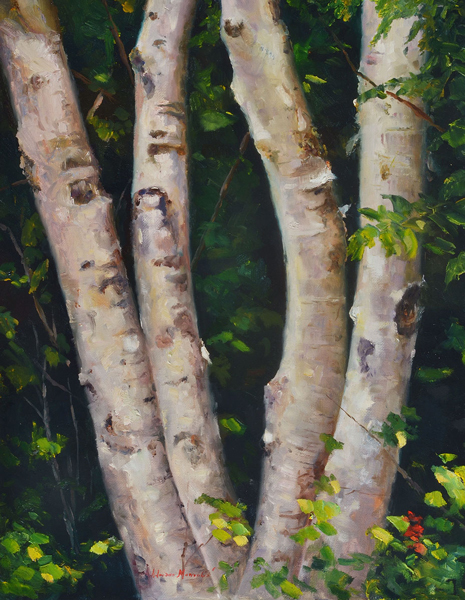 This painting titled Summer Birch is the latest creation in a series of paintings on white birch. I was particularly taken by the way the sinuous curves of the tree trunks give movement to this image, softening an otherwise austere setting. This oil on panel measures 14″x18″ and comes framed in a custom made gold frame. If our paths cross while hiking the Adirondacks this Summer, I hope you’ll stop and chat awhile. I can guarantee I’ll be there. 2 Responses to "From Adriano Manocchia’s Studio: Summer in the Adirondacks"
Dear Mr. Manocchia, I have admired your work for several years. It is so realistic and captures the quiet, serene, and remote moments of an angler and his love of nature and water. I was wondering if you could tell me the inspiration (location) of the painting, “Mountains of Eden” which graces the current issue of Gray’s Sporting Journal in the article called,”The River of Real Time.” It looks like a place I have stood and fished, in Yellowstone NP, at the junction of the Lamar River and the Soda Butte Creek. I am sure there are several such sites in the western states, but it looks so familiar to me. Thank you for your time and for your response…..